Eco friendly, soft, customizable, and dare I say - much prettier than paper. 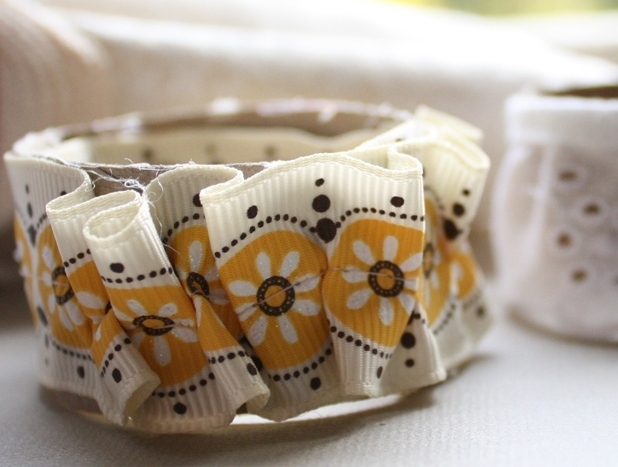 These napkin rings are made from paper towel and toilet rolls. With some glue and some haberdashery you can dress them up properly. Now pass the crumpets darling. (or paper towel roll if you buy those-gasp!) to approx 1.5 inches width. 2. With a hot glue gun in hand, make a strip of glue down the middle of the ring. Immediately place the ribbon (or what have you) on and press firmly. Cut two pieces of fabric 15x15 inches. As an alternative, you could do one piece of fabric and just fold in the sides and stitch, but I like a more polished look, so I use two pieces. Also-for this I used the same fabric for both sides. All my other napkins have two different sides, and I think it makes them prettier. Place them right sides together and pin. Sew, leaving a four inch opening for turning right side out again. Press firmly, getting your creases even and flat. Topstitch it all, and admire your gorgeous napkin. Also, my mom bought that exact fabric for me to make her some napkins. I was supposed to do them with my serger but my rolled hem foot is missing so it's just sat for MONTHS now. I'm going to do this for her now that I've seen how nicely they turn out.